4/13 kicks off a once-in-a-lifetime tour of Experience Events. VIP Tickets can ONLY be acquired with the purchase of the SPECIAL VIP TICKET EDITIONS OF THE SOUNDTRACK at participating stores in each market. This will be short and sweet…I hope. There is a lot happening in the next few weeks and we want to relay the information to you in the most direct way possible. 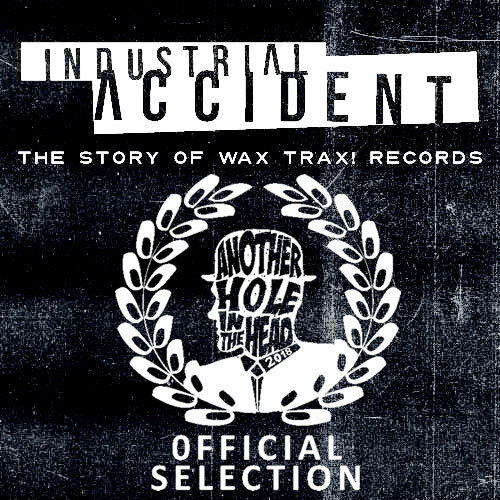 As some of you know, preorders for Industrial Accident in all formats and variant editions for the film and soundtrack are open now, ahead of the official release date of 4/16/19. 1. The expanded “Cash Grab” Box Edition will come with a bonus mystery 7-inch with **PREORDERS ONLY!! After preorders close in April the Cash Grab Box will NOT include this extra special item. 2. In addition, the Box has been moving pretty quickly and we only have a limited amount left in stock. There is a good chance we sell out of this edition before the April 16 release date. If you have been on the fence about buying one of these beauties, the train may be leaving the station fairly soon. -You’ve been warned. Note: For those of you who have been emailing on why it hasn’t shipped yet – The official release date is APRIL 16th, 2019. and will ship right around that date. 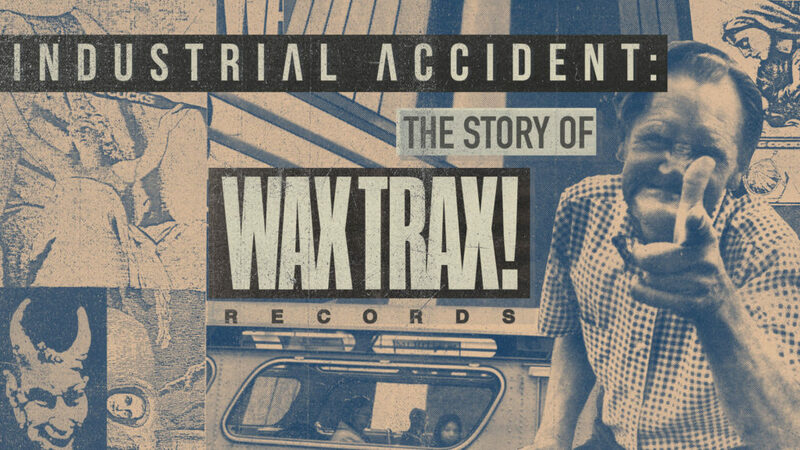 As part of the soundtrack launch, WAX TRAX! has pressed a special edition exclusively for Record Store Day 2019. Ask your local stores about the special RSD Limited Edition blue vinyl and get this baby in your hands before anyone else on Record Store Day – April 13, 2019. We will not be selling this special edition anywhere outside RSD events. When they’re gone, they’re gone.. Collectors, start your engines!! As an extension of the RSD launch, we’ve cooked up something very special. Wax Trax! is hitting the road with our friends at Vans and RSD to bring INDUSTRIAL ACCIDENT to select cities. We will be screening the film FREE in 6 locations around the US and Canada. 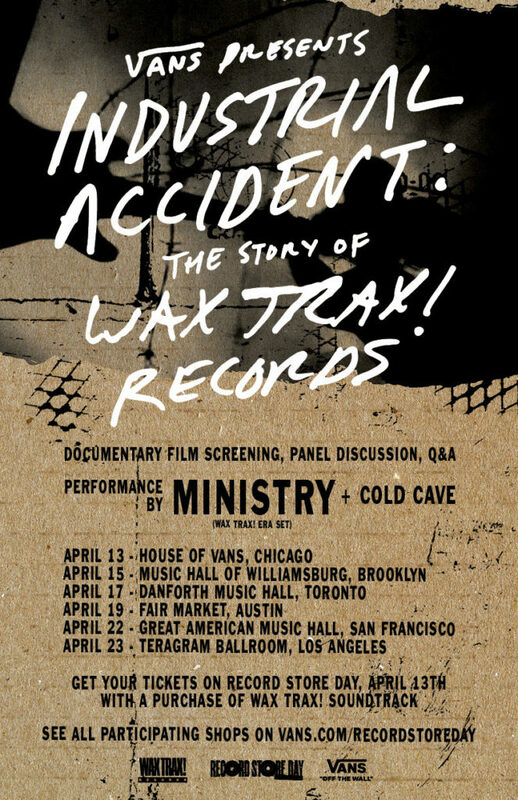 As if the documentary wasn’t enough, these events will include a live performance by MINISTRY playing Wax Trax! era jams!!! I’ve seen the playlist and I promise that this will be one you don’t want to miss. 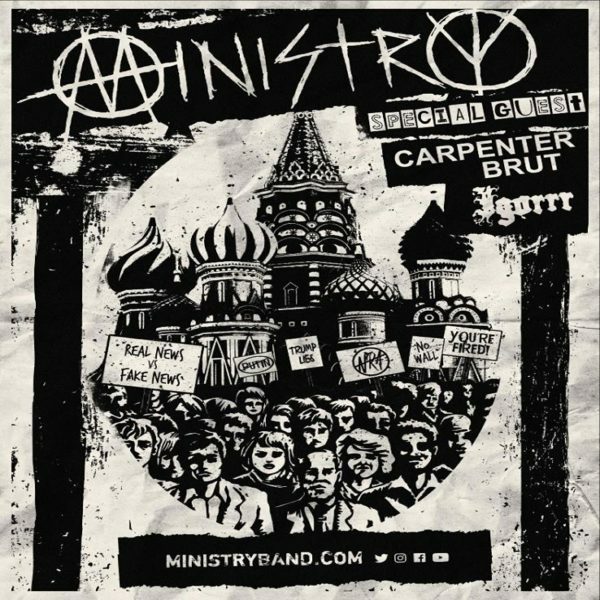 Cold Cave is opening for Ministry in each city. We are kicking off this mini-tour in our hometown of CHICAGO on April 13, 2019 at HOUSE OF VANS. We will have more details on venues and instructions coming very soon! There are two official ways to get tickets to the screenings & concerts. 1. VIP: Two VIP tickets for guaranteed entry will only be available on Record Store Day (4/13/19) with the purchase of the IA soundtrack (Ltd Ed blue vinyl) at select record stores in above screening cities. The complete list of specific VIP Ticket stores will be released through Wax Trax! / RSD / Vans closer to Record Store Day. 2. GA: General Admission tickets are free. A RSVP link will become available and we will pass along the info closer to RSD. However, one very important note. Once the venue has reached capacity GA entry is not guaranteed. What this means is after VIP tickets enter, if there is only room for let’s say 439 seats left until capacity, if you are #439 in line, you will be totally good…If you are #440 in line, you will not be very happy. Everybody who RSVPs will have the same chance as long as you’re there before the cut off. and YES, we expect all these shows will reach sold out capacity. Our suggestion – GET IN LINE EARLY! We will have more details on GA ticket RSVPs coming soon! 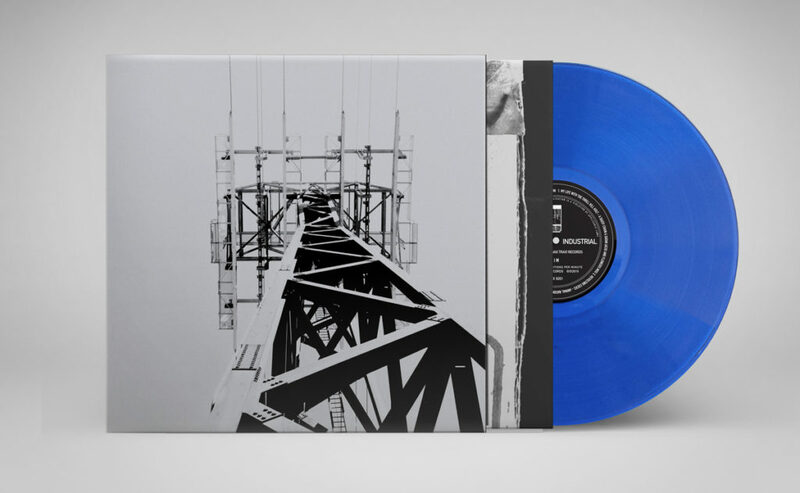 RSD – Special limited blue pressing. Only available at official RSD events in the US & Canada. GA: Entry is first come first served until venue reaches capacity. 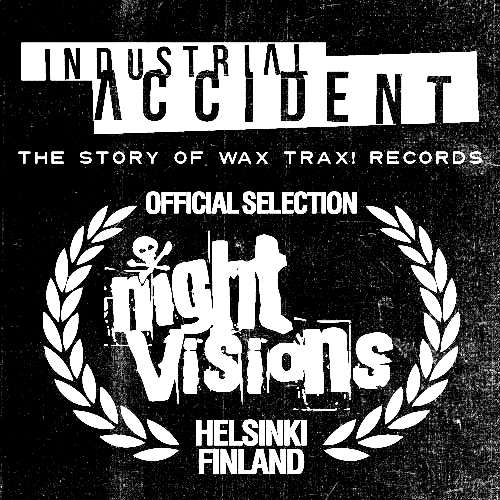 We will send an RSVP link for GA tickets to screening cities via these Wax Trax! news blasts, as well as Twitter, Facebook and Instagram. 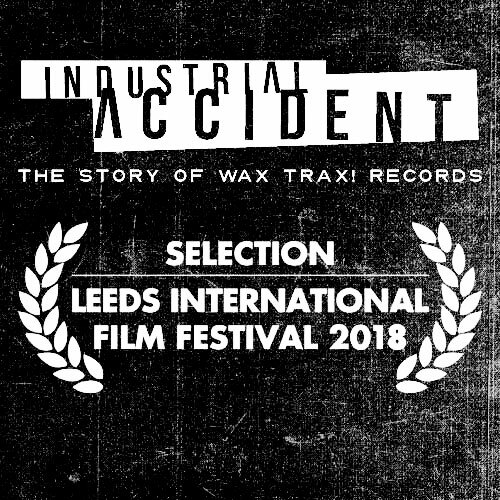 VIP: Two VIP tickets available on Record Store Day with purchase of Industrial Accident limited soundtrack at select record stores in screening/tour cities ONLY. We will announce participating record stores in screening cities via Wax Trax! news blast,Twitter, Facebook and Instagram. I guess that wasn’t really “short”…but it sure was sweet! Jello Biafra, Al Jourgensen, Groovie Mann just added to Denver Film Festival panel & screening of the Wax Trax! documentary on Friday Nov. 9. 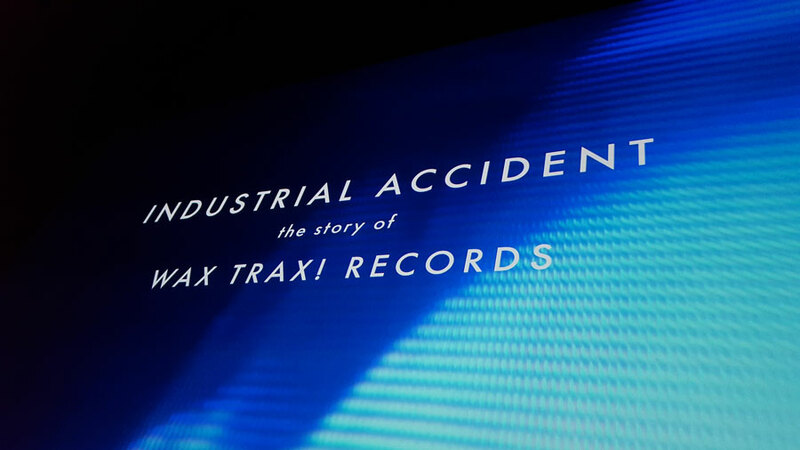 That’s right – The artist’s panel scheduled for November 9th as part of INDUSTRIAL ACCIDENT: The Story of Wax Trax! 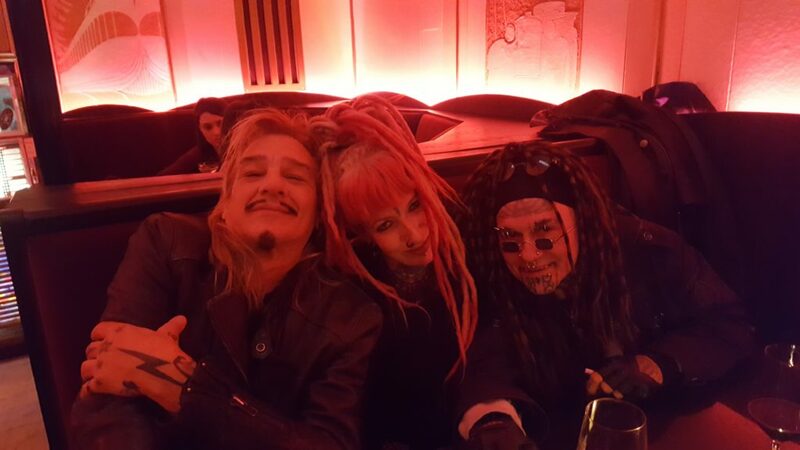 Records will now include Ministry front man, Al Jourgensen, Groovie Mann from My Life With The Thrill Kill Kult, and long time Wax Trax! collaborator, friend and Colorado native, Jello Biafra. A second screening of the award winning documentary will screen also on Saturday November 10. In addition, a special Wax Trax! 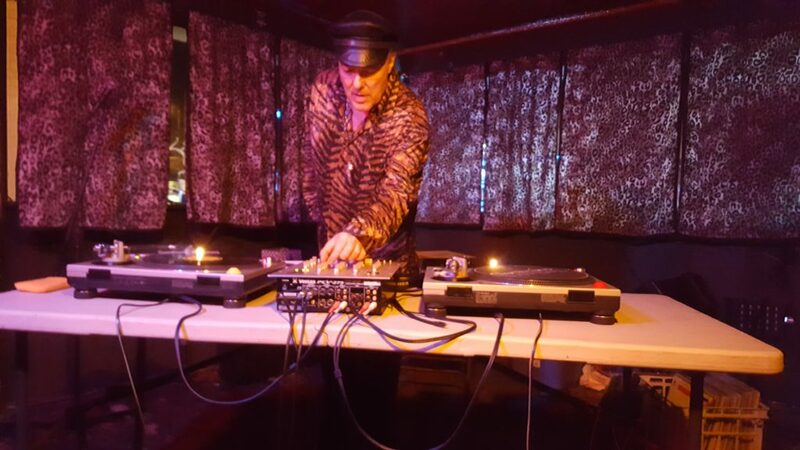 event has been planned with a DJ set from Jello Biafra following the Friday night discussion at the Lion’s Lair. Tickets for both screenings can be found here.  All your hard work with contacting festivals and letting them know you want to see the film has paid off! We will be screening back in the UK at the LEEDS INTERNATIONAL FILM FESTIVAL on November 3, 2018. This will be our last UK festival scheduled. We hope some of you all can check it out. Well, it looks like Golden Gates and Tenderloins are in our future. 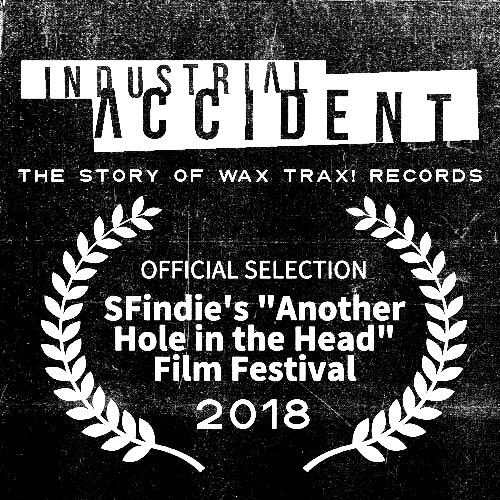 We are super honored to be screening INDUSTRIAL ACCIDENT in San Fransisco this November and December as part of ANOTHER HOLE IN THE HEAD 2018 programming. Actual screening dates and times are not firmed up and we will let you know as soon as the festival announces the details. Yep, the Wax Trax! documentary is heading to the Twin Cites. We’ll be in the land of Paisley Parks, Twin Tones and Husker Dues. 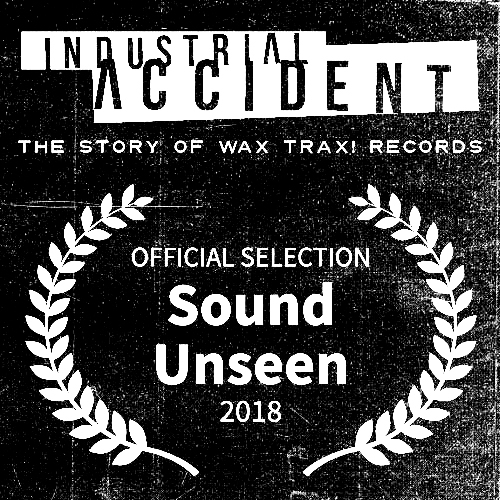 Please join the awesome crew at SOUND UNSEEN FILM FESTIVAL in Minneapolis, MN as they screen the Wax Trax! documentary over multiple nights. We just got word that the first screening sold out pretty quickly but it looks like they have scheduled a third showing of the film. I wouldn’t delay on picking up tickets for one of these other screenings or you may just be out of luck – You’ve been warned! Let us not forget about the screenings we have scheduled already! 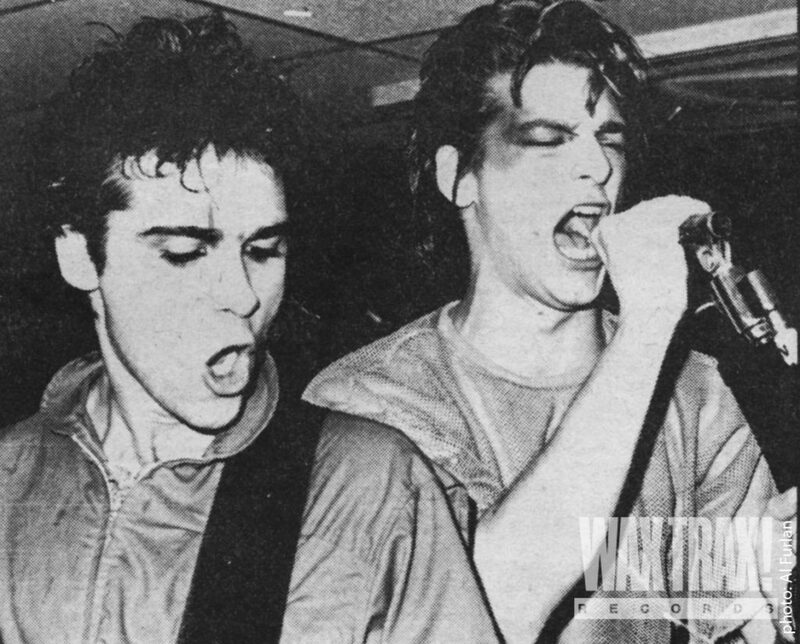 The Wax Trax! documentary will be in Barcelona twice (Oct. 27 & Nov. 4) and Madrid on Nov. 3. 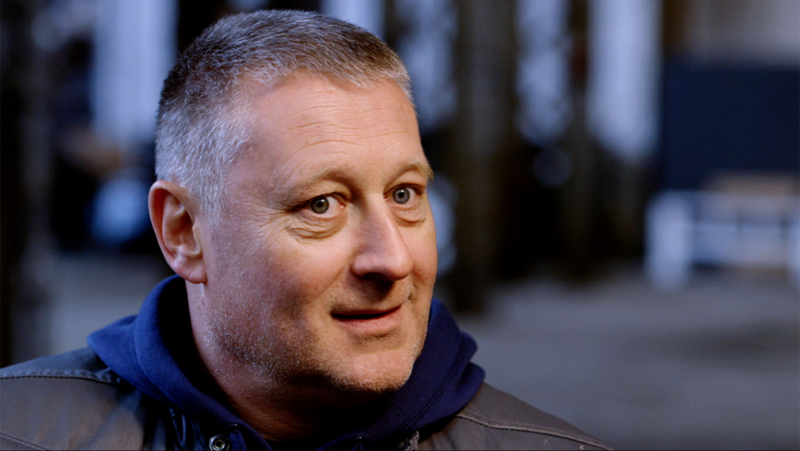 For the Saturday, October 27 screening, Richard Jonckheere and Patrick Codenys will join Julia Nash for a special artist panel/ Q&A. Tickets for all three screenings can be found at IN-EDIT Barcelona, and IN-EDIT Madrid. 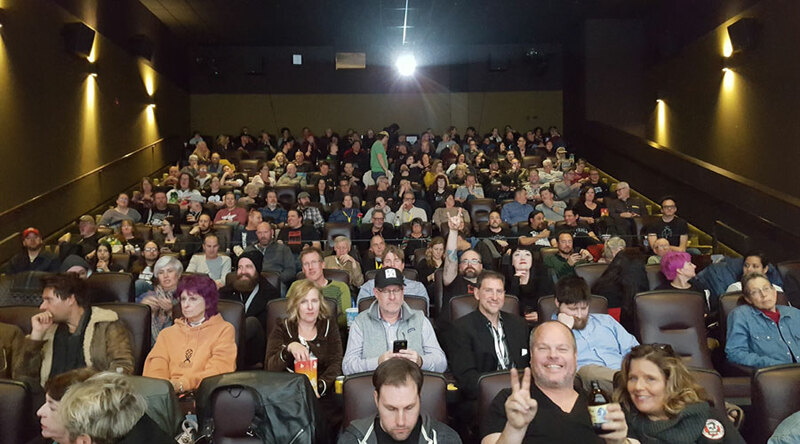 Don’t forget, a full list of screenings can be found on our screenings page here at waxtraxfilms.com. Happy Monday Wax Trax people! A lot to talk about regarding INDUSTRIAL ACCIDENT and the film festival circuit that we are now neck deep into. Before we get into some past, present and future news, I wanted to again address a question that we keep getting, A LOT. Some of this has been repeated many times but hey, some folks are just finding out about the documentary so it makes sense that we might have to go over this a few more times. A: Trust us, nothing would make us happier than to usher this film through the ultimate finish line and make it available for purchase. Some people may not understand everything that goes into creating a project like this and then getting it to mass market. We legally can not sell this movie until we pay for the proper licenses for music in the film. Will that happen? -We hope so. But this is such a complicated process that it continues to be an uphill climb. A: Part 1, We have paid for all the music in the film under something called a festival license. Typically it allows the filmmaker to show the movie publicly at festivals as they look for distribution, buyer, investor, etc. to help with funding for the much larger commercial license. The downside of this kind of license is we are contractually obligated to screen only at festivals. Our festival license will run out in 2019. Let’s hope we can acquire the funding to take this to the next level. A: Part 2, Just to clarify again – We don’t pick the festivals, the festivals pick us. If we get passed up by let’s say a Texas festival, there isn’t a lot Wax Trax! can do about it. -Just trying to be as transparent as possible. Hope that helps. We want to thank everyone who came out to our ROOFTOP FILMS screening in Brooklyn just over a month ago. We sold out the HOUSE OF VANS with over 900 Wax Trax! fans spread out in front of two screens. The response to the collector’s pop-up shop and archive gallery exhibit was incredible and we met so many amazing people throughout the night. Thank you! 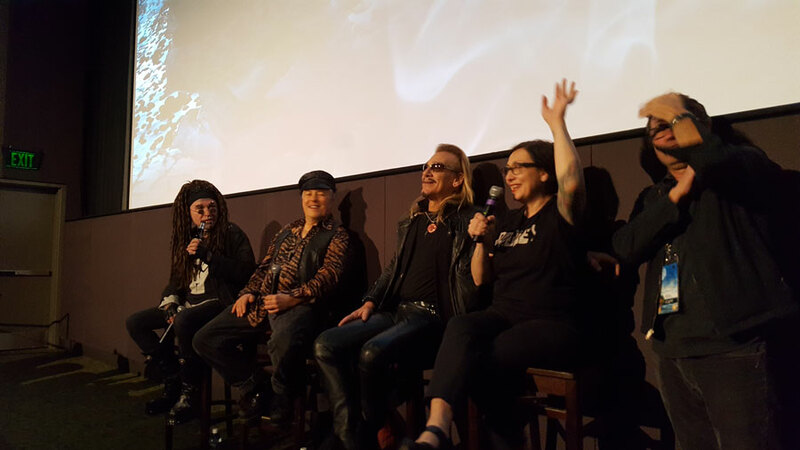 You can read more about the Brooklyn event at REVOLVER magazine. In the weeks that followed NY, we were able to get the film in front of fans in Massachusetts and then all the way over in Belgium. It has been a wild global ride and it ain’t over! What is next?… How about Greece, Switzerland, Northern UK, Canada, Spain, California, Michigan, Washington, Arizona…and of course Chicago? Starting this week we have some very special screenings planned taking place all over the world. If you have been wanting to see this film and you will be in any of these areas, we strongly suggest checking out some of these festivals as we start a two month Blitzkrieg across the globe. As I’ve said above, there is no guarantee that we will be able to release this film commercially due to music licensing costs. 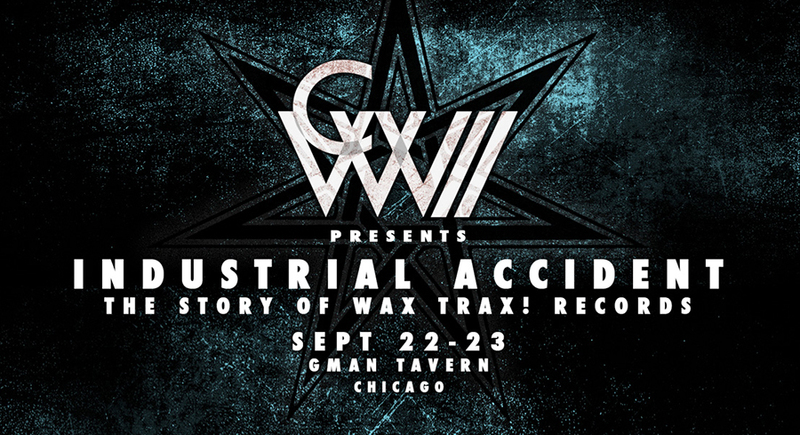 It may be to only chance to see INDUSTRIAL ACCIDENT: The Story of Wax Trax! Records. You snooze, you may lose! We still have a few more things up our sleeve and will be announcing more screenings in the next few weeks. However, it is really you the fans that have the power to drive this film to a festival near your town. As I have mentioned before, we do not pick the festivals, the festivals pick us. If they don’t think there will be an audience, they may not want to take any risks. This is not a complete list by any stretch and if you know of a festival in your area that runs between now and spring 2019. 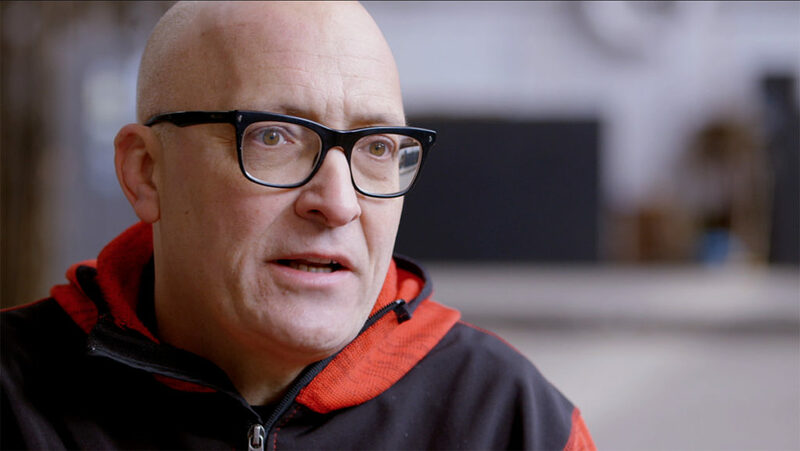 Send them an email and let them know that the story of Wax Trax! Records does indeed need to be told at their festival. For some non-movie news, how about all the amazing new releases, tours and projects by a ton original Wax Trax artists? That’s it for now. More news coming soon.